So….Audrey’s back. Let us celebrate with some old-school classics. To thank the folks over at Haven for bringing our girl, back, I would like to recognize October 24, 2014 as National Haven Day. It seems like there are national holidays for everything else, so I don’t see why I can’t make up one for Haven. Besides, it’s to honor the return of our favorite Haven Saver. In the grand scheme of things, nothing much. But if you like, you should let your friends and fans know that on October 24th they should tweet using the hashtag, #NationalHavenDay. The episode airing on the 24th is 5×07, Nowhere Man, written by Brian Millikin. You can see the preview over at Hulu. For the week leading up to October 24th, share with at least one new person, anything you want about the Syfy show Haven. Bonus points if you get them to watch an episode. Super Bonus points if you get them to marathon the entire show before friday because that’s a remarkable feat and I would love to meet whoever does that. Haven fans are some talented people. 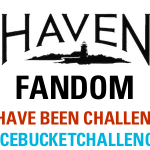 So if you create anything for #NationalHavenDay that you want to share, email me ( ), use the hashtag, and/or tag me somehow (I’m on Twitter and Instagram as @aimeej21) and if we can make it happen, I’ll add it to this post. Let’s spread the word and let old and new viewers know that Audrey Parker is back!! 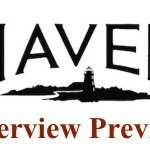 It’s the story of detective Audrey Parker and her mysterious ties to a town called Haven and is based on the Stephen King novel, The Colorado Kid.The thing to know about Haven is that some people have gifts that usually have a drawback to them, so instead of superpowers they’re called Troubles. Helping her to figure out her past are her partner Nathan Wuornos and bad boy with a heart, Duke Crocker. It has a little bit of everything: drama, action, romance, comedy, and a sci-fi element to it. It’s on Syfy with past seasons on Netflix.